Distribution: Mountains in south-east and northern Queensland. Derivation of Name: Araucaria; After the province of Arauco in Chile. bidwillii: After John Carne Bidwill (1815-1853), a botanical collector of the 1840 - 1850 period. Araucaria is a genus of conifers consisting of about 18 species. 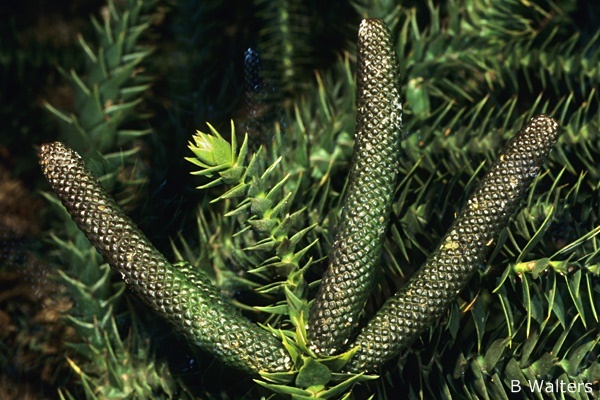 There are three Australian members of the genus; A bidwillii, A.cunninghamii (the hoop pine from Queensland and New South Wales) and A.heterophylla (the Norfolk Island pine). The latter is endemic to Norfolk Island but is widely planted in coastal areas throughout Australia. 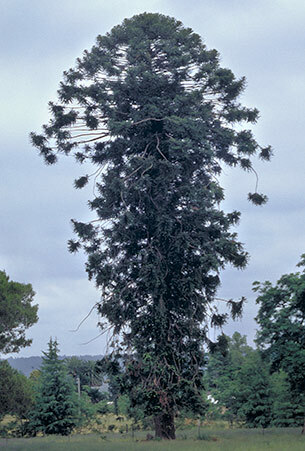 Araucaria bidwillii is a tall tree growing 30-45 metres in height, with a straight, rough-barked trunk, and a very distinctive symmetrical, dome-shaped crown. It is an emergent species in subtropical rainforest and is confined to Queensland, where it occurs mainly between Nambour and Gympie and west to the Bunya Mountains, with a small occurrence in north Queensland on Mt.Lewis and at Cunnabullen Falls. The glossy green leaves are lance-shaped, sharply pointed and about 50 mm long. The male cones are narrow, cylindrical structures to about 20 cm long on the ends of short branchlets. They usually appear in autumn. The large, female fruiting cones are very large (football sized) and generally mature in summer through to early autumn but they are not formed every year (generally once every three years). Both the male and female cones are shed from the tree and can be a hazard to anyone underneath. Because of their size and weight, the female cones are particularly dangerous but the male cones are also capable of causing injury, particularly when they fall from the top of a large tree. An exclusion zone should be created around the base of any tree that contains cones. 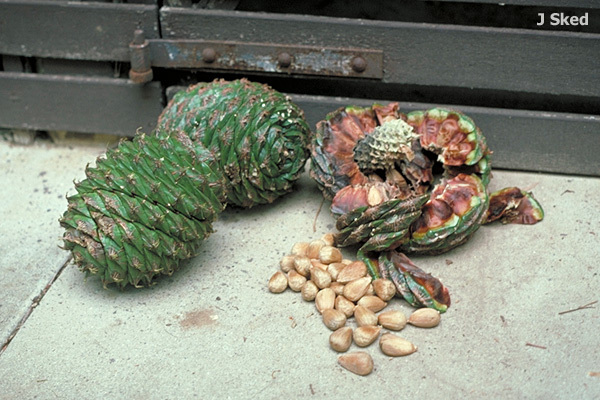 Each female cone contains from 50 to 100 large "nuts". These are edible and were a rich source of food for the Aborigines of south-east Queensland. During the "Bunya season" the Aborigines would temporarily set aside their tribal differences and gather in the mountains for great Bunya Nut Feasts. The bunya pine is widely cultivated in many areas and, despite it's sub-tropical/tropical origins, is hardy in colder districts of Australia. Reports indicate bunya pines growing and fruiting in cold climates such as Bright in the Victorian Alps (where plantings about 100 years old exist) and at Mt Martha, some 60 km south of Melbourne on the Mornington Peninsula. These locations are certainly a long way from "home" in Queensland, both climatically and geographically. The species adapts to a range of soils but will not succeed in those which remain waterlogged for long periods. The bunya pine also makes an attractive container plant when young, for both indoors and outdoors. Propagation is generally carried from seed which germinates readily when fresh. Cuttings have also been successful but must be taken from upright growing shoots - cuttings from side shoots will not grow erect. for information about the hazard of the male cones.